On a cold winter night, nothing is better than a warm and spicy meal to heat things up. All you will need for this recipe are the ingredients, a large wok, a sharp knife and 20 minutes! Cut your favourite vegetables and place them all in a large bowl. I used organic broccoli, peppers, eggplant and red onion. Gently press the liquid out of your block of tofu by placing it between paper towels to absorb the liquid. After that, place it in a rectangular bowl and marinate it in coconut aminos or Braggs aminos. Alternatively you can use hoisin sauce or gluten free soy. Add garlic powder and cumin to the tofu and let sit while you prep the curry. Heat your wok to low/medium heat and add sesame oil and avocado oil (enough to cover the bottom of the wok.) Add minced garlic and onion and stir for a minute. Be sure the garlic does not burn. Add all of your vegetables to the wok. Stir frequently. In a separate pan set to medium pour the tofu and sauce into the pan until it gets golden and slightly crispy. Flip the tofu frequently to ensure it is brown on all sides. Once your vegetables start to soften, add your curry paste or canned pre-made curry sauce. Mix well. 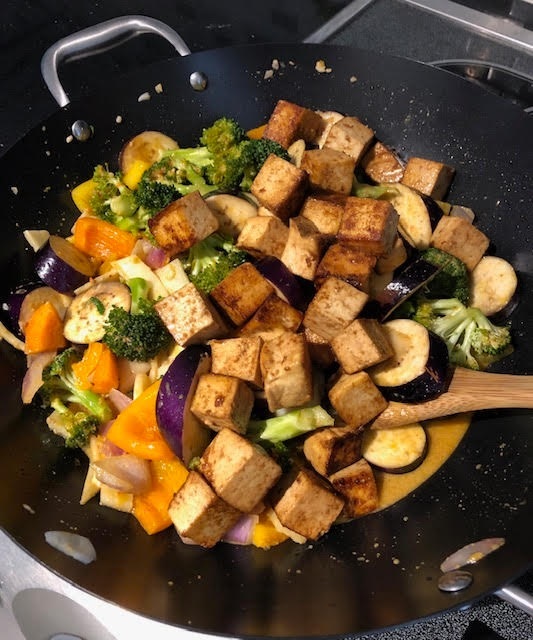 Add your tofu once it’s ready and continue to mix everything together so that the curry sauce is evenly distributed and covers all the tofu and vegetables. Let simmer until the vegetables are cooked to your liking. Remove from heat and add to a large bowl to prevent overly cooked, soggy vegetables. Eat curry on it’s own for a low-carb option or add on top of brown rice, quinoa or lentil pasta.